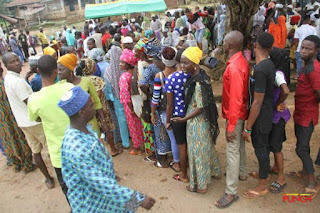 Delegations from the Missions of the European Union, the United Kingdom and the United States said they observed widespread interference and intimidation of voters, journalists, and civil society observers by political party supporters and security agencies during Osun governorship rerun. The observers noted that their findings mirrored those of leading civil society groups that also observed Thursday’s supplementary election, and noted that the situation contrasted with the findings of September 22 election. In a joint statement on Saturday, the partners stressed that the neutrality of the security services and responsible conduct by party agents, both inside and outside polling units, would be essential to free, fair, credible and peaceful elections in 2019. The delegations said, “In contrast to our overall findings on the vote of September 22, we were concerned to witness widespread incidents of interference and intimidation of voters, journalists, and civil society observers by some political party supporters and security agencies. They commended voters in the state for exercising their democratic rights peacefully and applauded the work of the Independent National Electoral Commission during both elections. The missions called for calm from all stakeholders and urged that any challenges to the election result should be made through peaceful and lawful means. “We restate our position of firm neutrality among all parties and candidates. We remain committed to supporting the Nigerian people in seeing free, fair, credible, and peaceful elections,” the statement added.